Your top five games of the past year. 2015 is upon us. It's the new year, and it's full of exciting new gaming possibilities. At this time it's also important to reflect back on the top gaming moments of 2014. The titles that represent the very best effort made by legions of talented individuals, solely designed to provide players with the maximum amount of entertainment. 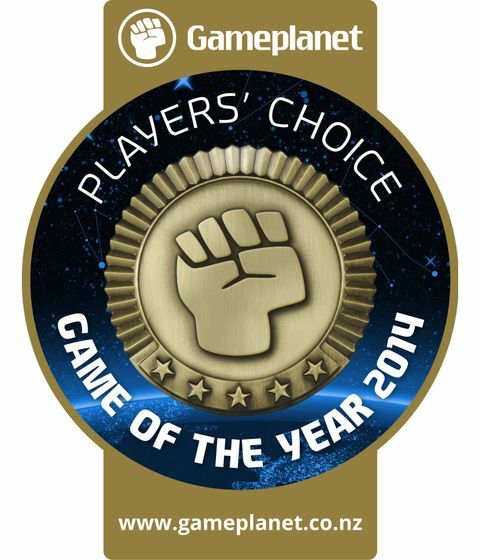 The Gameplanet Players’ Choice Awards are the largest videogame awards in New Zealand, determined by the votes of thousands of dedicated Kiwi gamers. Next, we invited you to vote for these games to determine the winner. Voting has now closed, and today we reveal the top five finalists and your overall Players' Choice Game of the Year. We said: 8.5/10 – "The humour is the real reason to play this game, and alongside the usual bad taste gags and celebrity burns, it’s great to see the writers having fun with the video game format specifically. They gleefully pick holes in such absurdities as the silent protagonist, fighters taking turns to attack each other, NPCs spouting canned dialogue, and the idea that a person would have time to record multiple audio logs while trying to escape an alien spacecraft. We said: 8/10 – "Despite [a] few gripes, Destiny delivers as a new-gen spectacle, and one that should keep gamers engaged for a long time yet. I’ve thrashed it in the last few days, and now I have hand cramps, a sure sign I was having fun – even though it can be a little repetitive and predictable. We said: 8.5/10 – "Everything about Dragon Age: Inquisition instills wonder, whether it's utilising your Stronghold’s War Room to direct Inquisition agents across the nations of Ferelden and Orlais to unlock new regions, perks, or resources, or the continued escalation of the central story and the eventual revelation of the antagonist. "The world is sold through numerous branching sub-quests, NPC conversations, and references to the previous games. It is a stunning achievement. Assembling this epic and directing the player through it is perhaps BioWare's greatest accomplishment to date. Our very warmest congratulations to everyone at BioWare and Electronic Arts from the team at Gameplanet. Congratulations also to Jennifer who is the winner of our Players' Choice voting competition and has scored herself over $500 worth of PlayStation 4 games!